iOS 4.0.1 has been released for iPhone 4, 3GS and 3G. 3G users can use Redsn0w 0.9.5b5-5 to jailbreak their iPhone. Redsn0w jailbreak is currently only for iPhone 3G. Here is the step by step guide to Jailbreak iPhone 3G iOS 4.0.1 Using Redsn0w 0.9.5b5-5. Download iOS 4.0.1 for iPhone 3G from here: Download iPhone iOS 4.0.1. Update to iOS 4.0.1 using iTunes. Download redsn0w: Mac or Windows. Start redsn0w 0.9.5b5-5 and point it to iOS 4.0 firmware and not iOS 4.0.1. 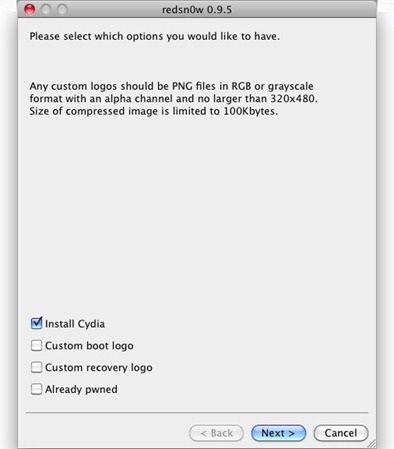 Select “Install Cydia” and click next. 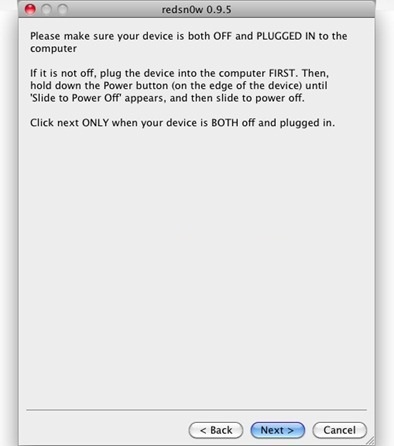 Make sure that your device is both turned off and connected to computer. Follow on screen instructions to put the device in recovery mode. Now sit back and let redsn0w do its work. Once the process finishes, you’ll have a fully jailbroken iPhone 3G running iOS 4.0.1.